Pup-pourri - stories, goodies and funstuff - Anatolian Shepherd Dogs - ASDI, Inc.
Help SPONSOR an Anatolian with the Cheetah Conservation Fund! See more information on our CCF sponsorship page! - Is the ASD for You? ---- New to the Breed? It CAN Happen! - Please read! 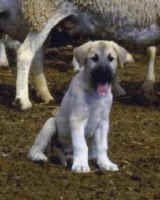 Anatolian Story: Watch this puppy grow! Adventures in Obedience - Anatolian Humor - Starring Zerrin! Anesthesia for the High Risk Patient with Nancy Rose, D.V.M. More involved with the Breed now? A great article about the genetics of white markings on dogs. Learn the genetic significance of the ubiquitous white on our Turkish dogs. Meet Our Members and their Anatolians! Photo Gallery - Anatolians everywhere! Turkey External links do not necessarily imply endorsement by ASDI, Inc.
Travel Through Turkish History - at WARP speeds! Mr. Plonsky's Dog Training Training information, tools, resources, many links. 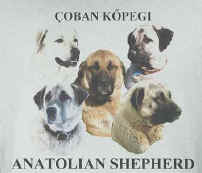 Anatolian Mailing list A free internet mailing list for folks with an interest in the breed and who'd like to talk to and meet others. Livestock Guardian Dog LIBRARY -starting a new LGD? Other training questions? Go here! Keep up to date on Anti-Dog Legislation The Dog Place. National Animal Interest Alliance Support responsible and sensible legislation.